Acne vulgaris is one of the most frequently treated illnesses in dermatology practice. It is primarily an illness of the sebaceous gland follicles, which are located predominantly on the face, back and chest. 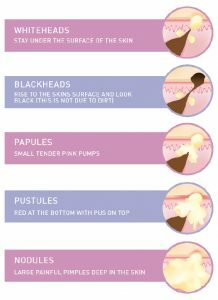 At first, they create non-inflammatory blackheads, but later a series of inflammatory lesions such as papules, pustules and lumps can also develop. This “common acne” is caused by increased androgen levels during puberty and subsides when the patient enters their thirties at the latest. A less common and more severe disease is acne inversa. It is an illness of skin appendages that starts in the sebaceous glands and has a secondary effect on the apocrine perspiratory glands. Areas particularly susceptible including axilla and the groin-pubic region, up to and including the gluteal region. It affects the back and stomach less frequently and very rarely affects otherwise typical acne regions, such as the face. Firstly we will assess your skin carefully and ask you a range of questions to discover the best course of acne treatment for you. If you are taking any medications or have done in the past we would ask you to bring the name of them along, as some medications can contra-indicate certain treatments. Previous history with regards to acne is very important in establishing the best course of acne treatment for you. In some severe cases of acne your practitioner may feel it necessary to refer you to a consultant dermatologist. The exfoliation from an acne chemical peel eliminates or reduces the appearance of acne blemishes & scars. Laser treatment works against acne itself by destroying the bacteria that infects it. Certain hormones cause the grease-producing glands next to hair follicles in the skin to produce larger amounts of oil (abnormal sebum). This abnormal sebum changes the activity of a usually harmless skin bacterium called P. acnes, which becomes more aggressive and causes inflammation and pus. Acne is known to be hereditary. If both your mother and father had acne, it's likely that you'll also have acne. Hormonal changes, such as those that occur during the menstrual cycle or pregnancy, can also lead to episodes of acne in women. Steroids can also cause acne to develop. There's no evidence that diet or poor hygiene cause acne. Although you may feel like you want to wash the skin serevral times a day this is not adviseable. Twice a day would be adviseable. Excessively cleaning the skin could cause dryness, your skin may then begin to produce more oil, which will them leads to more spots. Although acne can't be cured, it can be controlled with treatment, products and/or medication. Treatment will depend on the severity of your acne, length of time suffered and also what previos treatments or medications have been previously tried. Even mild cases of acne can cause distress. If your acne is making you feel very unhappy, we are to help. We can support you through your journey of treatment. Whether it be laser, peels, or medication.